In recent years, an important Parkinson’s disease (PD) research focus has been on gut-related pathology, pathophysiology, and symptoms. Gastrointestinal dysfunction, in particular constipation, affects up to 80% of PD patients and idiopathic constipation is one of the strongest risk-factors for PD. Lifestyle factors such as smoking and coffee consumption, as well as blood urate levels, have been associated with a decreased PD risk. These factors may also be influenced by the bacteria living in the human gut mediating the effects of various chemicals and nutrients on disease processes. In a contribution in the current issue of the Journal of Parkinson’s Disease, researchers review some of the latest studies linking gut microbiota to PD. While it is known that a history of smoking reduces the risk of PD by about 36%-50% and coffee consumption reduces risk by about 33%, the underlying mechanisms are unclear. At the same time, the concentrations of different microbiota are altered in PD patients, where for example, Prevotellaceae bacteria are found in reduced levels. The literature review indicated that smoking affects gut microbiome composition and this seems to be associated with improved barrier function and anti-inflammatory effects in the colonic mucosa. It remains to be established whether these simultaneous changes are causally related to each other and eventually to PD. “Also a possible reverse effect of gut microbiota on smoking propensity and its relevance for PD is an interesting field for future studies,” added Dr. Scheperjans. In the case of coffee consumption, most of the direct effects on the GI tract are related to gut motility, such as gastro-esophageal reflux, gallbladder contraction, and increasing colonic motor activity. The authors reviewed studies relating gut motility to microbiota compositions and suggest that there might be complex relationships between coffee, microbiome concentrations, and the altered gut motility found in PD patients. They also note a few studies concerning urate metabolism related to microbiome concentrations in PD patients. While the evidence is as yet scarce, they suggest that further studies could be valuable. 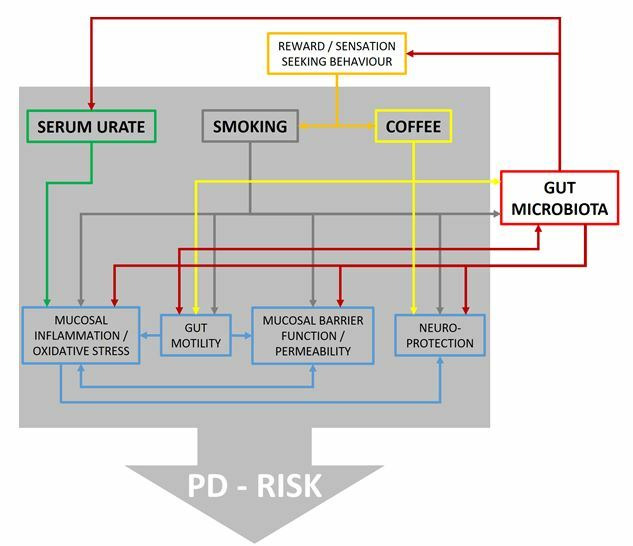 Caption: Flow chart illustrating reported effects between urate, smoking, coffee, and different physiological domains with possible relevance for PD risk. Furthermore, it is shown which of these factors are also related to changes in gut microbiota providing ground for interactions. However, at present direct evidence for such interactions is missing and information is derived from in vitro as well as in vivo studies on humans and animal models. “Linking Smoking, Coffee, Urate, and Parkinson’s Disease – A Role for Gut Microbiota?” by Filip Scheperjans, Eero Pekkonen, Seppo Kaakkola, and Petri Auvinen (DOI 10.3233/JPD-150557), Journal of Parkinson’s Disease, Volume 5, Issue 2 (2015) published by IOS Press. To obtain the full text of this study and additional information contact Daphne Watrin, IOS Press, at +31 20 688 3355, d.watrin@iospress.nl. Journalists wishing to interview the authors should contact Anna-Mari Hursti at Anna-Mari.Hursti@hus.fi.